Looking for ideas for your Brisbane work Christmas Party? Slideways Go Karting Brisbane at Eagle Farm (only ten minutes from Brisbane’s CBD) are the experts in group go karting parties, with the lead up to Christmas the perfect time to get racing! We can cater for work Christmas Parties of any size, starting from a minimum of 10, up to 120 people or more. 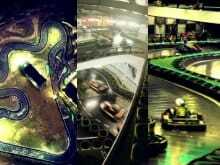 Our Christmas Party go kart racing packs give you an authentic racing experience which is socially competitive and great fun for all, with qualifying sessions, real wheel to wheel racing action, winners trophies and more! Bookings are essential, for our Christmas Party group packages and a minimum deposit (paying for at least one person) is required to secure group bookings. This venue has a zero alcohol and drug policy, we reserve the right to refuse entry to anyone who we suspect is intoxicated. 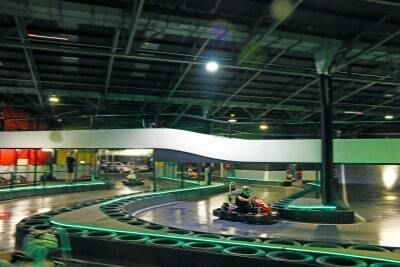 If you don’t have a total of 10 people in your group, our general arrive and drive go karting prices have you covered. Find out more about our great packages below, or contact us for a custom package. Exclusive facility hires are also available by application for extra large group bookings. Real Racing Simulation – fastest in qualifying gets pole position on the grid for the race, all sessions are electronically timed, so bragging rights are ensured! Bookings Essential, call us on (07) 3868 2225 from 10am-10pm daily! Want more information or would like to make a booking? Contact us or call us on (07) 3868 2225. Cancellation Policy: Cancellation of bookings within 48 hours of the scheduled race time will result in all prior payments forfeited. Also, click here for our terms and conditions. PLEASE NOTE: This venue has a zero alcohol and drug policy, we reserve the right to refuse entry to anyone who we suspect is intoxicated.